According to him, it was also to be ensure that the party started early since the elections was only a few months away. 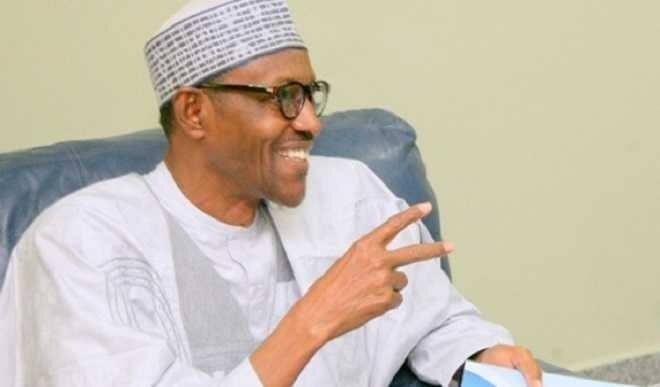 Presiddent Buhari had announced his intention to run last April after months of speculation at a meeting of the National Executive Committee (NEC) of the ruling All Progressives Congress (APC) leadership. The NEC meeting was attended by Vice President Yemi Osinbajo, Senate President Bukola Saraki, Speaker of the House of Representatives Yakubu Dogara and APC governors. President Buhari commended the group for identifying with him using their time and resources all these years without getting anything in return. President Buhari said, “I have to thank you for identifying yourself as a group consistently for all these years and getting nothing for it visibly. “I think it is worthy of commendation and I am extending my personal appreciation for your principle. “For you to identify openly with this organisation all these years it means a lot. Thank you for your time, for meeting from time to time to consolidate on your tactics, I am sincerely grateful to you. “I had to announce before the National Executive Committee (NEC) about my intention to ask for the party’s nomination for next year’s election so that we can save a lot of time and cool tempers. “A lot of people are trying to make it a habit of being a nuisance to themselves and to many Nigerians. So when I announced my intention, I said okay let those who are serious come out and I try to make sure that the party is reorganize and consolidated so that we start from bottom to top. “So, that Nigerians will be involved and that each constituency will pick those they want to represent them at various levels. “Whether local government chairmen, counselors, state house of assemblies, House of Representatives, Senate and finally the Presidency itself. “I am very pleased, we thank God and we thank technology because what use to happen that caused my ending up in Supreme Court, they will just seat down, look at the constituency and award numbers and they will say anybody who disagrees should go to court. “Now, when somebody is looking for the next meal where will he get money to pay SANs (Senior Advocate of Nigeria). But thank God technology has come in. “With PVCs (Permanent Voters Card), with Card Reader, wherever you register it will show whether you voted or not. That is why voters education is very important. “Tell people that the PVC is their nationality and they are entitled to it. They can use across party, religion, ethnicity and so let them take pride in their PVC, let them keep it and use it. “So, this is an additional assignment for your group. “I have been talking to the governors urging them to carry out voters education, it may not Favour them but people will eventually understand whether they tell the truth or not, people will do what they feel right. Earlier, Chairman of the Buhari Support Group Centre (BSGC), Umaru Dembo, said the group had been in existence since 2014. According to Dembo, “Before you Mr. President is the group that you yourself approved of in 2014 before your election and we still see you as a leader that has sacrificed his entire life for the well being of the common man in Nigeria. “So, we have through thick and thin, rain or sunshine, hot or cold we are here to assure Mr. President that since 2014, we have been working, expanding and helping to explain the new life that your government has ushered in for the good of Nigerians. The group also presented a book titled “Buhari The Change President” derailing the fantastic ‘activities of his administration authored by Dr. Sani Muktar Bichi and Umaru Dembo. Dembo added, “Those that recognise your great tasks especially in tackling those that stripped Nigeria of its funds instead of ruling the country, deep corruption in various facets of life in Nigeria and efforts you are making to retrieve no end and valuables tactfully, Nigeria and Nigerians were deprived of and the reluctance of the perpetrators of the crime to return to Ceaser what is Ceaser and to God what is God’s. “We are all prepared to work for a sane, safe and prosperous Nigeria than to go the rotten way and destroy the country. “This is very important as the common men and women which are your key supporters and lovers and voters will now afford to implement their wish without the tortuous money wasting and seemly corrupt delegate system.